Interested in the Downtown Area? Choose the number of rooms to suit your needs and click to view that specific section. Arena District/Downtown - 221 N. Front Street, Unit 109 - Available Now!! 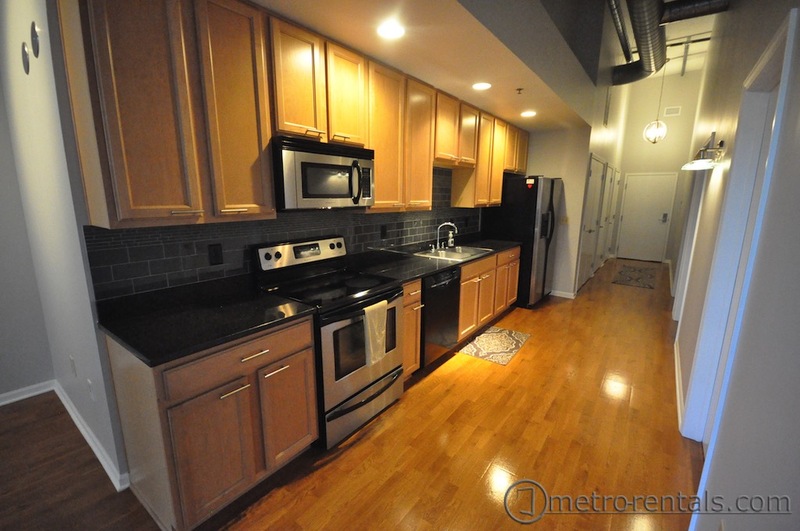 Wi-Fi and Parking Included - Spacious two-bedroom, one-bath downtown condo in the heart of the Arena District. Tons of storage, including walk-in closet in master bedroom (with closet organizers) and private storage space in the basement. Kitchen with granite counter-tops, stainless steel appliances and upgraded light fixtures. The rooftop patio features a grill, plenty of seating/lounge chairs, and an incredible view. In-unit laundry and one parking spot in connected parking garage. This is a non-smoking unit. A small dog will be considered, additional restrictions and fees may apply. Rent is $1495/month, flexible lease term available. For more information or to schedule a showing please call (440) 655-0413 or use the contact link below. Arena District/Grandview Area - 600 Goodale Street - Available Now - Located in close proximity to Grandview and the Arena District, Inside and out, every home features Kaufman's superior details, from fixtures to finishes. Vessel sinks, granite countertops, and pendant lighting all come standard. So does access to the bike trail, a secure covered garage, and people who think like you do. Nestled between the Arena District, Grandview, Upper Arlington and Downtown, 600 Goodale expands the definition of urban living to make sure proximity is balanced with tranquility. There are 1, 2, and 3 bedroom floorplans available. For more information or to schedule a showing please call (614) 220-5600 or use the contact link below. Discovery District/Downtown - Lear Block – Available Now 2-bedroom Units!!! 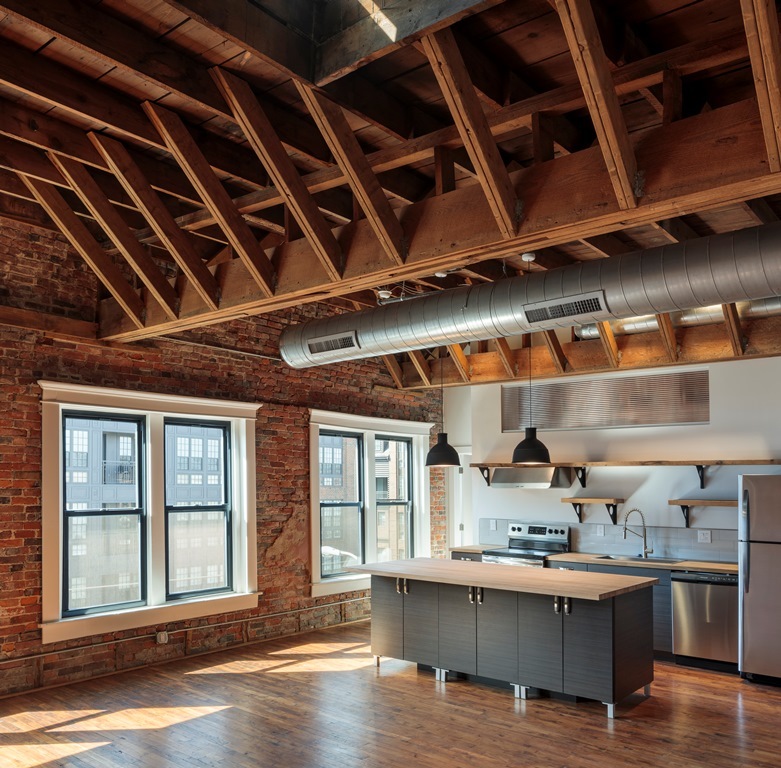 Introducing Lear Block, Downtown's authentic one and two bedroom urban lofts. Carefully crafted from Oscar Lear's 1910 automobile manufacturing building, these stunning units offer rich interior finishes including beech hardwood floors, brick walls, and heavy timber posts and beams. Open floor plans provide occupants the design flexibility lofts are known for and heated garage parking with direct elevator access to residences affords ultimate convenience and security. Within walking distance to coffee shops, restaurants, bars, and downtown's gourmet grocery, The Hills Market. Pets are welcome, 50 pound weight limit, additional fees apply. Rent starting at $1995/month. To schedule a tour, please call Day Companies at (614) 965-0638 or use the contact link below. To see our other available homes, please visit Day Companies. Downtown - 15 East Gay Street, Unit 2C - Available June 2019 - An outstanding location in the heart of downtown, 15 E. Gay Street include distinctive finishes and features. Open floor plans and soaring ceilings offer residents maximum spatial flexibility. Oversized windows for an abundance of natural light. All appliances including washer/dryer. Stainless steel island in kitchen. Access to roof terrace which includes chaise lounge chairs, table with umbrella, grill and shower. Other amenities include: central A/C, high efficiency HVAC system, cable ready, 24 hour maintenance. Pet Policy one-time non-refundable fee of $300 and monthly pet rent of $30. Sqft: 1677. Rent $1700/month. To schedule a tour, please call Day Companies at (614) 450-1760 or use the contact link below. To see our other available homes, please visit Day Companies. Downtown - 15 E. Gay Street Apt. 3B - Available Now parking included - An outstanding location in the heart of downtown, 15 E. Gay Street includes distinctive finishes and features. Open floor plans and soaring ceilings offer residents maximum flexibility. Oversized windows for an abundance of natural light. All appliances including washer/dryer. Stainless steel island in kitchen. Track lighting and ceiling fans throughout. Access to roof terrace which includes chaise lounge chairs, table with umbrella and a grill. Other amenities include: central A/C, high efficiency HVAC system, cable ready, 24 hour maintenance, one parking spot. Sqft: 969 Rent: $1475/month. To schedule a tour, please call Day Companies at (614) 450-1760 or use the contact link below. To see our other available homes, please visit Day Companies. Sorry, there currently are no efficiency units available in this area. Please check back for future listings. Have a property in this area you'd like to advertise? Contact us here. Arena District/Grandview Area - 600 Goodale Street - Available Now - Located in close proximity to Grandview and the Arena District, 600 Goodale is a mid-rise apartment complex featuring highly visible, iconic architecture with high-end design and finishes. From wellness and philanthropy to sustainability and innovation, every element is created to inspire the life you live. 600 Goodale features one , two and three bedroom apartments with open floor plans, high-end finishes and modern aesthetics. These spacious floor plans are designed to enhance your inspired and purposeful lifestyle. Inside and out, every home features Kaufman's superior details, from fixtures to finishes. Vessel sinks, granite countertops, and pendant lighting all come standard. So does access to the bike trail, a secure covered garage, and people who think like you do. Nestled between the Arena District, Grandview, Upper Arlington and Downtown, 600 Goodale expands the definition of urban living to make sure proximity is balanced with tranquility. Rent for one bedroom apartments start at $1160/month. For more information or to schedule a showing please call (614) 220-5600 or use the contact link below. Discovery District/Downtown - Lear Block – One Bedrooms Available June - Introducing Lear Block, Downtown's authentic one and two bedroom urban lofts. Carefully crafted from Oscar Lear's 1910 automobile manufacturing building, these stunning units offer rich interior finishes including beech hardwood floors, brick walls, and heavy timber posts and beams. Open floor plans provide occupants the design flexibility lofts are known for and heated garage parking with direct elevator access to residences affords ultimate convenience and security. Located in the burgeoning Discovery District, Lear Block is within walking distance to coffee shops, restaurants, bars, and downtown's gourmet grocery, The Hills Market. Pets are welcome, 50 pound weight limit, additional fees apply. Rent starting at $1285/month. To schedule a tour, please call Day Companies at (614) 965-0638 or use the contact link below. To see our other available homes, please visit Day Companies. Olde Towne East/King-Lincoln District – 94 North 20th Street – Available May - New windows with screens, updated bathroom, and kitchen with granite countertops. Heat included in rent. This apartment has 2 bedrooms and 1 full bath. It is located in a beautiful Victorian era building just moments from Downtown, Columbus State, Franklin Park and the Short North. Large living room with a decorative fireplace and two large windows that allow for plenty of natural light. French doors lead out to your own private balcony with plenty of space for guests and outdoor furniture. The kitchen features built-in storage, stove and refrigerator. Adjacent to the kitchen, is a dining room. The full bath with a classic claw foot ceramic tub/shower. Both bedrooms are nicely sized, and have reach-in closets. Bonus features of this apartment include off-street parking, a secured entry, and a personal storage room in the basement which includes its own washer/dryer hookups. Pets are not permitted in this apartment. Rent is $950/month with an additional month security deposit. Photos and video are representative of the units in the building, available unit may be slightly different. To schedule a tour, please call Eljay Properties (614) 299-4425 or use the contact link below. Arena District/Downtown - 221 N. Front Street, Unit 109 - Available Now Wi-Fi and Parking Included - Enjoy 925 square feet of living space with high ceilings in this spacious two-bedroom, one-bath downtown condo in the heart of the Arena District. Tons of storage, including walk-in closet in master bedroom (with closet organizers) and private storage space in the basement. Kitchen with granite counter-tops, stainless steel appliances and upgraded light fixtures. The rooftop patio features a grill, plenty of seating/lounge chairs, and an incredible view. Within walking distance to all the best downtown Columbus has to offer, including Nationwide Arena, Short North, Columbus Commons and more. In-unit laundry and one parking spot in connected parking garage. This is a non-smoking unit. A small dog will be considered, additional restrictions and fees may apply. Rent is $1495/month, tenant responsible for utilities (basic Wi-Fi included), flexible lease term available. For more information or to schedule a showing please call (440) 655-0413 or use the contact link below. Arena District/Grandview Area - 600 Goodale Street - Available Now - Located in close proximity to Grandview and the Arena District, 600 Goodale is a mid-rise apartment complex featuring highly visible, iconic architecture with high-end design and finishes. From wellness and philanthropy to sustainability and innovation, every element is created to inspire the life you live. 600 Goodale features one , two and three bedroom apartments with open floor plans, high-end finishes and modern aesthetics. These spacious floor plans are designed to enhance your inspired and purposeful lifestyle. Inside and out, every home features Kaufman's superior details, from fixtures to finishes. Vessel sinks, granite countertops, and pendant lighting all come standard. So does access to the bike trail, a secure covered garage, and people who think like you do. Nestled between the Arena District, Grandview, Upper Arlington and Downtown, 600 Goodale expands the definition of urban living to make sure proximity is balanced with tranquility. Rent for two bedroom apartments start at $1880/month. For more information or to schedule a showing please call (614) 220-5600 or use the contact link below. Discovery District/Downtown - Lear Block – Available Now 2-bedroom Units!!! Introducing Lear Block, Downtown's authentic one and two bedroom urban lofts. Carefully crafted from Oscar Lear's 1910 automobile manufacturing building, these stunning units offer rich interior finishes including beech hardwood floors, brick walls, and heavy timber posts and beams. Open floor plans provide occupants the design flexibility lofts are known for and heated garage parking with direct elevator access to residences affords ultimate convenience and security. Located in the burgeoning Discovery District, Lear Block is within walking distance to coffee shops, restaurants, bars, and downtown's gourmet grocery, The Hills Market. Pets are welcome, 50 pound weight limit, additional fees apply. Rent starting at $1995/month. To schedule a tour, please call Day Companies at (614) 965-0638 or use the contact link below. To see our other available homes, please visit Day Companies. King Lincoln District/Downtown - Whitney Young - The Armstrong - Available Now - This three bedroom, 2½ bathroom townhouse with 2 car garage features stainless steel brand name appliances including built in microwave, gas stove and double door refrigerator. Large light giving windows with custom wood blinds bathe the hardwood flooring in sunlight on the first floor, which boasts a 3 sided glass fireplace. Plush carpeting in the bedrooms, 2nd floor laundry connection, granite top double sink vanity and two walk in closets in the master suite are just some of the features you will love to call home. Off street parking, charming street lamps, porches and patio areas, along with beautiful lush grounds make this address one to desire. Adjacent to Mayme Moore Park, home of the summer jazz series and within walking distance of Martin Luther King Library, the historic Lincoln Theater and King Arts Complex. 24 hour maintenance. Rent is $1745/month. For more information please call (614) 291-9121 or use the contact link below. Arena District/Grandview Area - 600 Goodale Street - Available Now - Located in close proximity to Grandview and the Arena District, 600 Goodale is a mid-rise apartment complex featuring highly visible, iconic architecture with high-end design and finishes. From wellness and philanthropy to sustainability and innovation, every element is created to inspire the life you live. 600 Goodale features one , two and three bedroom apartments with open floor plans, high-end finishes and modern aesthetics. These spacious floor plans are designed to enhance your inspired and purposeful lifestyle. Inside and out, every home features Kaufman's superior details, from fixtures to finishes. Vessel sinks, granite countertops, and pendant lighting all come standard. So does access to the bike trail, a secure covered garage, and people who think like you do. Nestled between the Arena District, Grandview, Upper Arlington and Downtown, 600 Goodale expands the definition of urban living to make sure proximity is balanced with tranquility. Rent for three bedroom apartments start at $2675/month. For more information or to schedule a showing please call (614) 220-5600 or use the contact link below.